Break up 2 bread slices and soak in 150ml water. Set aside. Put the tomatoes in a food processor or blender. Add the garlic, 75ml olive oil, white wine vinegar and sugar. Set aside a 1cm slice cucumber and ¼ green pepper, then add the rest to the blender. Add the soaked bread, then process the mixture until smooth; season and add a little water if it is too thick. Chill in the fridge for at least 1 hour – it must be cold when served; if you are in a hurry, you can always add a couple of ice cubes to each portion. Meanwhile, cube the remaining bread slices. Heat the remaining 25ml olive oil in a frying pan and cook the bread, turning regularly until golden. Dice the reserved cucumber and pepper and the onion. 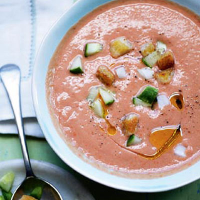 Scatter the croutons and diced veg over the chilled soup and, if you like, drizzle with extra virgin olive oil. This appealing, fresh white has exactly the right intensity of flavour to complement, but not overpower, the tomatoes.